This lithograph is taken from plate 23 of 'Afghaunistan' by Lieutenant James Rattray. 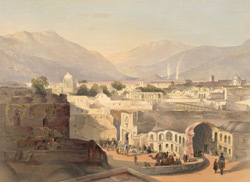 He sketched Kandahar in December 1841 from the rooftop of the former residence of the province's governor, Sirdar Meer Dil Khaun, who was brother to the Emir. Pictured on the left is the tomb of Ahmed Shah and on the right the Bala Hissar (fort) and citadel. The houses in the foreground were dilapidated due to frequent earthquakes. Afghans believed that ancient Kandahar had been built by Alexander the Great. Rattray's drawing shows the fourth city on the site, built 95 years earlier by Ahmed Shah. Vast ruins of the earlier cities remained. Rattray wrote that Kandahar, a Durrani capital, was situated in a well-cultivated and fertile irrigated plain circled by mountains: "Every hill and building around rejoices in some singular title and each has its legend." The city was oblong-shaped, and its ramparts spanned four miles, inset with six gates. Four main streets forming bazaars ran through it and met in the centre, a point marked with a domed building. Because streams ran through the city, there was plentiful water and foliage. Kandahar was divided into numberless walled divisions, in which each particular clan took up its abode. Among the peoples congregating here were Persians, Uzbegs, Bhaluchs, Hazaras, Jews, Armenians, Hindus, Ghilzais, Durranis and Arabs. The Durranis were the largest and most powerful of these groups, and generally regarded as the most polished and liberal-minded Afghans. The Popalzais, a branch of the Durranis, were superior still, and from them sprang the Saddozis, the sacred royal house of Afghanistan.